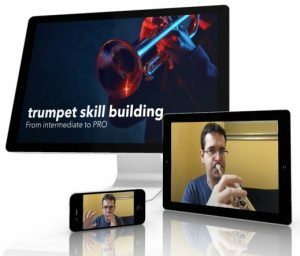 Let’s look at some principles for playing the trumpet, particularly the high register. By giving you some new input here, I want to inspire you to reflect on your daily practice and strengthen your ability to differentiate. This will lead to smarter practice and faster progress. Do you have any special exercises to train the muscles involved? Do you practice them on a regular basis? Daily? How do you use this power while playing? Does the applied power result in the intended effect? Or are you wasting your power? Are you able to use this power skillfully? How does using more power effect sound quality? What exercises do you know to enhance your skill? Which of them do you practice regularly? Do you check to see if these exercises are working for you? By skill, I mean being able to do what you intend in an effective and economical way. On the other hand, not doing that which is an impediment (e.g. tension not needed to achieve the intended goal). At the end of the day, you need both power and skill. You have to work on both components of playing. When you practice, you can go from the holistic towards the specific or the other way around. Both strategies have their advantages and shortcomings. Let’s look at the topic of breathing. One way to work on breathing is to train yourself to inhale with your diaphragm only (which is a bad idea btw.). You can do this by lying on the floor on your back and being careful only to allow your stomach to move; your chest remains completely unaffected. By doing so, you’re programming a clearly defined movement (which I don’t recommend in this case). More about this later. Or look at the way you stand, and then find a stance in which you feel a steady, yet flexible balance. Doing this will enhance conditions for your body to function optimally. The idea is that your system already knows how to breathe well; you just need to get out of the way and let your body do its job. What works best for me is to differentiate from area to area. For example, I approach movements of the tongue and lips rather specifically. 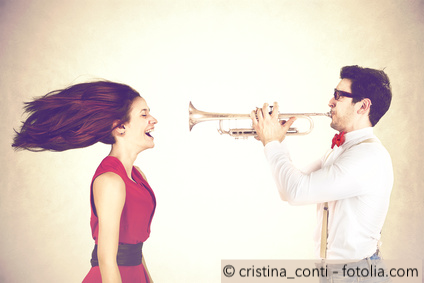 This is because when playing the trumpet, we use our lips and tongue differently than we do in everyday life, such as when we talk or eat. On the other hand, inhaling and breath support are already part of daily life, so I approach them from a more general, holistic point of view. When you think about what happens during the day vs. what happens when you play, you will understand why differentiation is important. Let’s return to the example of inhaling. If I had “programmed” breathing with my diaphragm only, I could then apply it when playing the trumpet. I would carefully pay attention to breath this way every single time. Then I’d be able to control this movement consciously. Or I could do the opposite and give up my desire to control everything. Instead, I could learn to trust that everything I practiced will function when I cease my constant checking to see if it’s working the way it should (or rather, as I believe it should work).